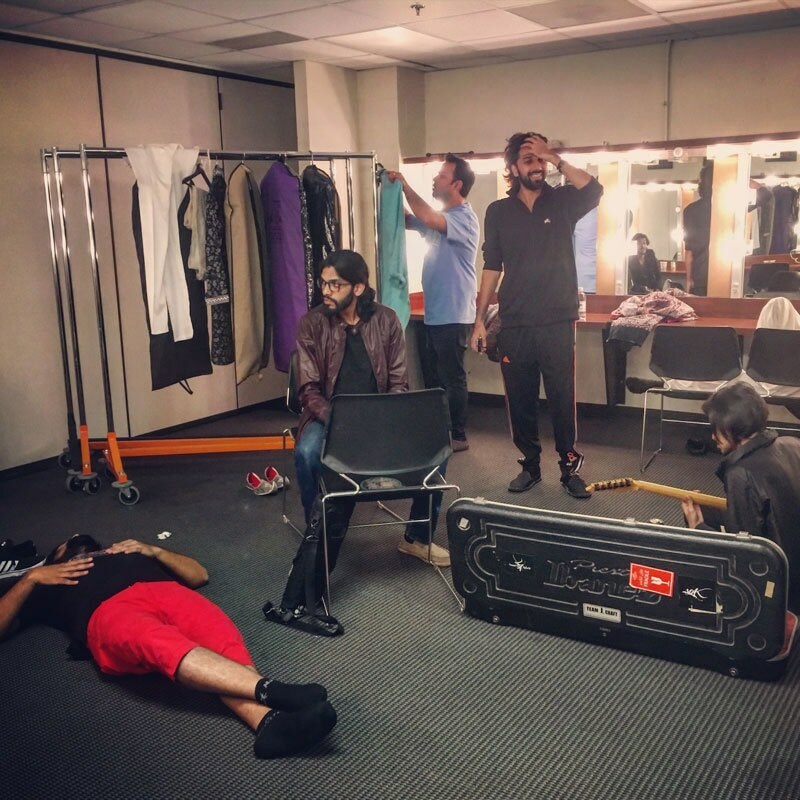 Dawn, What goes on behind the music when a Pakistani band tours America? walked into the designated hotel room to find it kind of full — and the occupants were only half of the band. 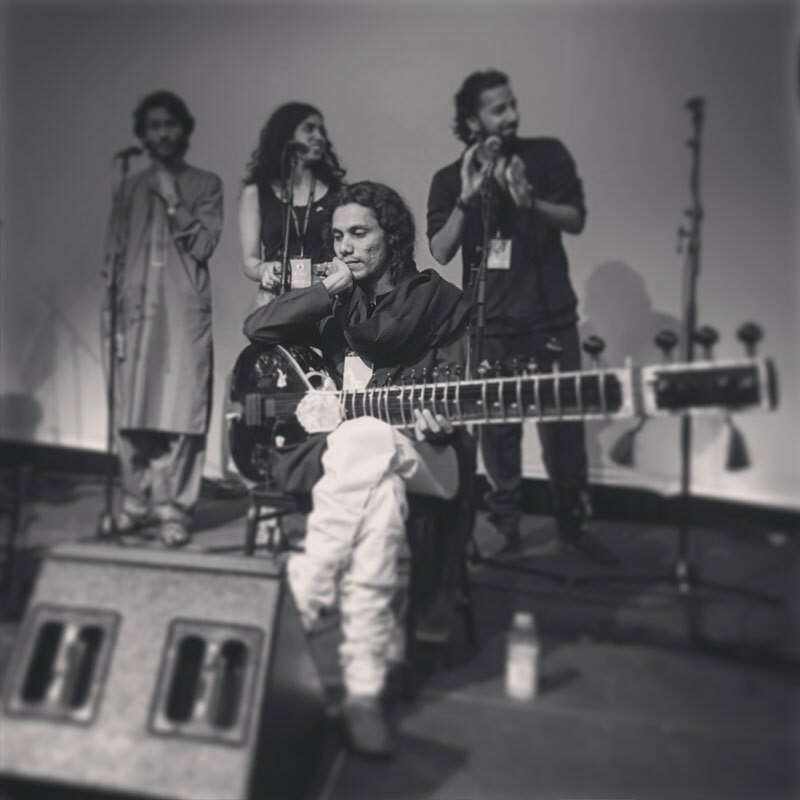 Singer, songwriter, composer and band leader Ahsan Bari was sitting on one corner of the floor. Next to him was backing vocalist and his right-hand band mate, Quaid Ahmed and facing them, on the bed, were Nimra Rafiq and Waqar Hussain. All four of them are part of a relatively-newer ensemble from Pakistan called Sounds of Kolachi. Although they’ve been around for the past three years, only in the last year or so have they generated some pretty major and consistent buzz. They’ve performed at major festivals across the country — Lahooti, Music Mela, I love Karachi, Karachi Eat — and have recently released their first album. 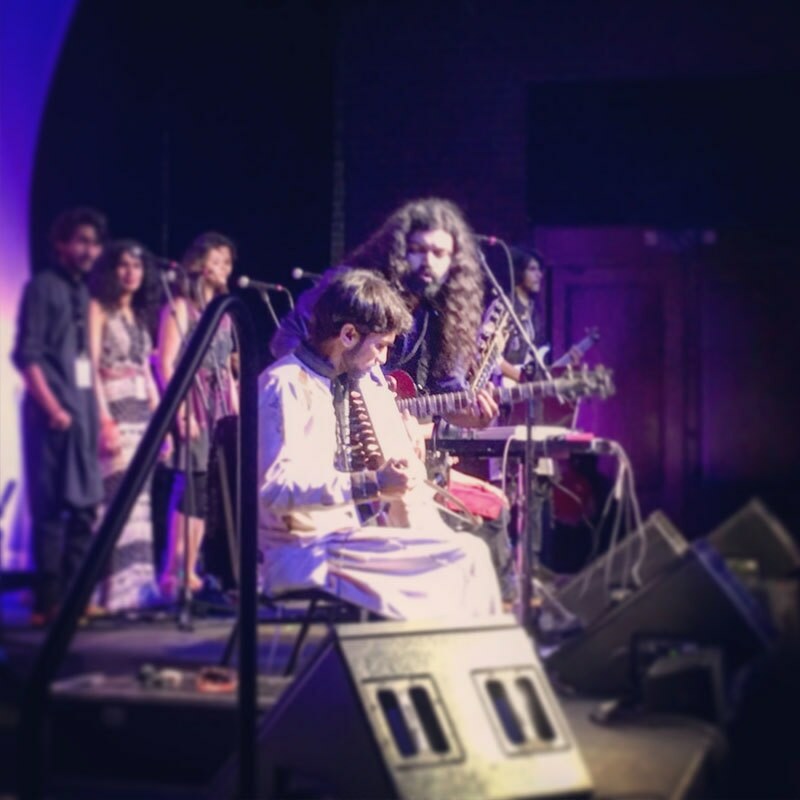 Sounds of Kolachi is currently on their first tour of the United States via a cultural exchange programme that has introduced many other Pakistani acts (Noori, Poor Rich Boy, Arieb Azhar, Zeb & Haniya and Khumariyaan to name a few) to American audiences — Center Stage. The view from the side stage at the Memorial Hall, University of North Carolina in Chapel Hill. On one of the side tables, an electronic tanpura produced sounds corresponding to different notes which were mimicked by the vocalists as they tried to get in tune. Today, they were in the middle of a several-hours-long vocal practice session. Tomorrow, the band was due to perform at the historic Memorial Hall at the University of North Carolina, Chapel Hill. For two days after that, they had back-to-back performances at the Savannah Music Festival in Georgia. Travelling through different countries, time zones, adjusting to a new country, being away from home and constantly changing locations is stressful. But the stakes are high and band leader Ahsan Bari is not taking any chances. 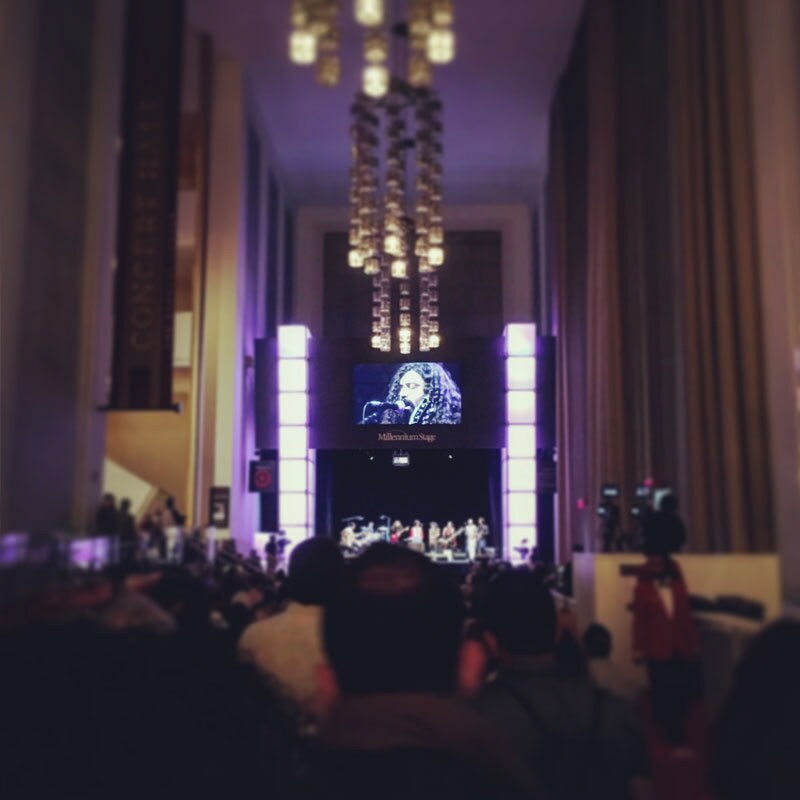 The Sounds of Kolachi performing on the Millenium Stage at The Kennedy Centre in Washington D.C.
“They’ve had time to relax and have fun in Washington D.C.,” he said. “But we have three back-to-back performances coming up and it’s time to get back on track. We practice a lot generally but in this session I’m trying to rid of all of the kachra (trash) from the last few days. After this they’ll be ready for the next few performances.” Some of the vocalists cough as their muscles are stretched and are advised by Ahsan to constantly drink warm fluids. The band as a whole will rehearse together after dinner. There is one casualty of the stress that comes from touring: backing vocalist Iman Shahid, the latest addition to the band, has a sore throat and has been advised by the doctor to rest her voice and only sing during the one or two hours while performing. She was fine by the time their performances in Savannah came around, but for now, they might be one man down. Sounds of Kolachi at the Savannah Music Festival. If anyone, Ahsan is feeling the pressure. “For the first time, I am [beginning to] understand what it really means to be a Pakistani or to represent your country,” he said a few minutes before their performance at the Memorial Hall, "That’s what I keep telling the others: your actions, words, performance affects what people will think about Pakistanis." The band had been conducting workshops and doing talks and soon they’d become familiar faces around campus. While they were walking down the street one spotted cars full of students often hooting and tooting their horn as they passed by them. Originally built in 1883, the Memorial Hall was created to honour the men at the University of North Carolina who fought in the Civil War. Walking down the backstage corridors of the hall gives you a glimpse into the repertoire of artists that have performed there — from the Nutcracker Ballet to the Pittsburgh Symphony to various acts from around the world. 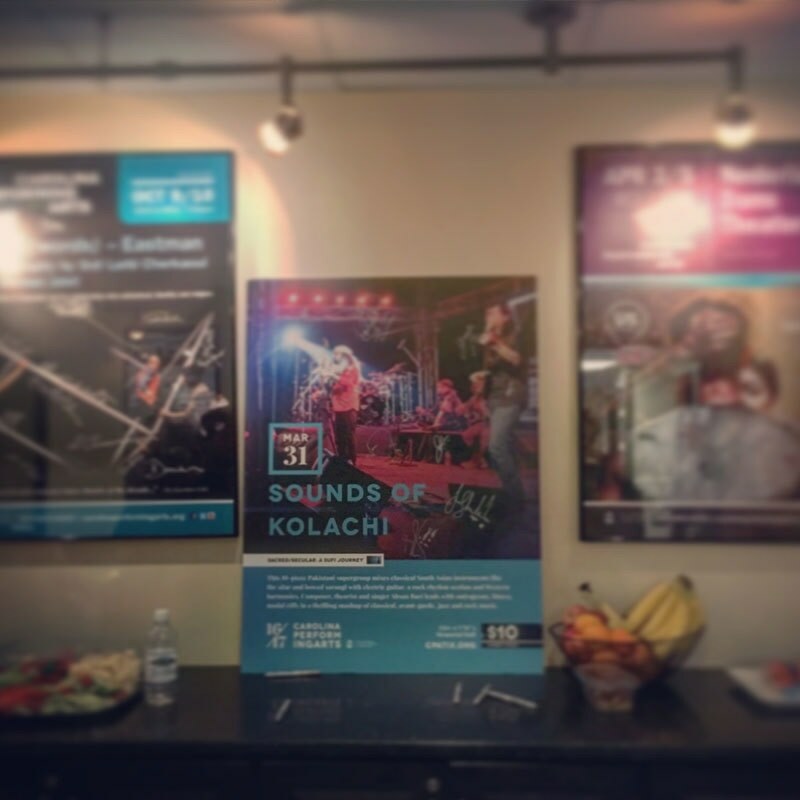 Sounds of Kolachi get their own poster that will be put up in the halls of the Memorial Hall, University of North Carolina, Chapel Hill. “I can’t believe I’ll be playing at the same venue as Zakir Husain, Edgar Meyer and Bella Fleck,” says Saif Abbas Rizwan, the bassist for the band. It’s the day of their big performance and we’re backstage. It’s huge. There are stairs leading down to hallways filled with posters of acts from around the world that performed here and make-up rooms of different sizes with the patrons’ names in a plate outside. The boys are in one massive room. Ahsan is stretching his legs out on the floor while some of the others get ready — wardrobe changes. Throughout the tour they have been wearing a mix and match of traditional clothes, perhaps far often than they ever have back home! It’s quieter in the girls’ room. “Nimra, can you please do my make-up,” implores Iman, who is donning a bohemian tie-and-dye dress bought locally, her hair falling down her shoulders, curly, natural and wild. “In a moment. Let me get done with mine,” responds Nimra as she confidently adds a few touch ups here and there. 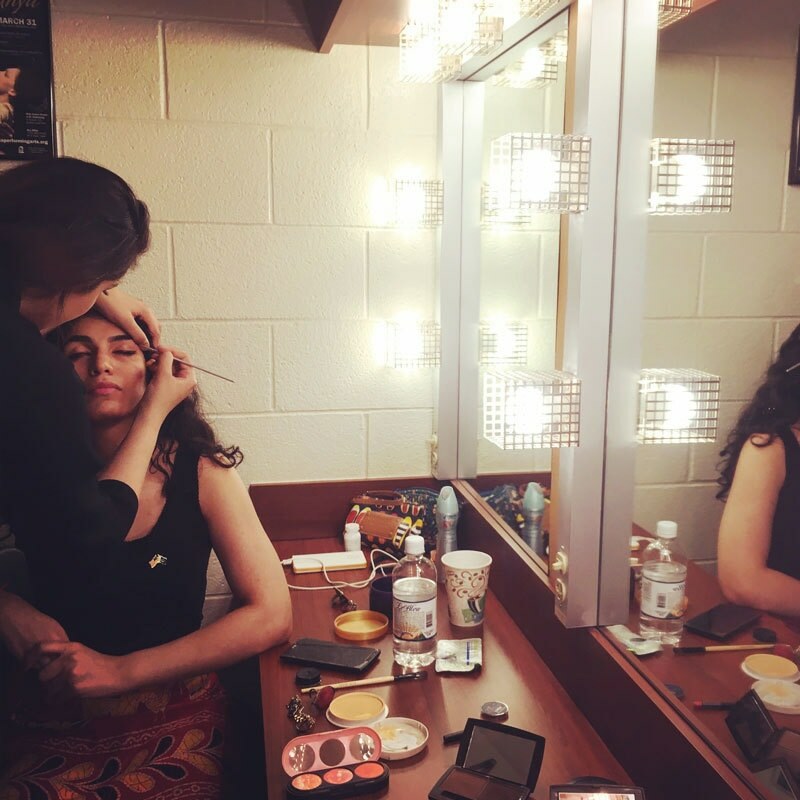 Nimra doing Iman's make-up before their performance at the Memorial Hall, University of North Carolina, Chapel Hill. Are you nervous? “Nope,” she said. “But I am very excited.” Her eyes light up. The two major stars of the shows are usually Gul Mohammad on sarangi and Waqas Husain on sitar. They’ve broken all of the traditional rules regarding the ‘right’ way to play the instruments handed down to them through generations — Gul’s sarangi is 160-years-old and Waqas is a seventh-generation sitarist. Encouraged by Ahsan, they launch into solos that sound more like progressive rock than strictly South Asian classical. They’re called behind the curtains a few minutes before the performance. The sound engineer with his mixing board, many knobs and instruments and several screens is set on this side, very close to the band on stage, but hidden from view. In a scene oddly reminiscent of Cameron Crowe’s Almost Famous, the band huddles together and hugs each other. “I want you to forget everything that I’ve said to you,” one can hear Ahsan say to the others. “Just focus on having fun.” There are some prayers, words of encouragement and the band is ready to perform. The audience numbers just above 900 attendees. Ahsan Bari takes a moment to relax while the rest of the band members get ready. 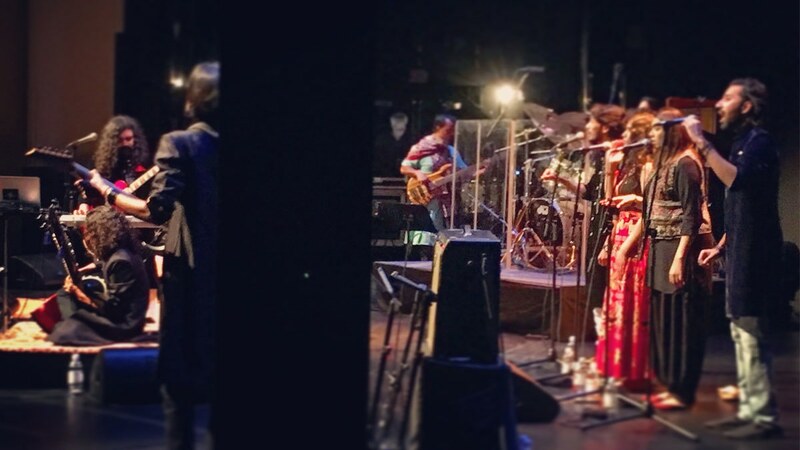 Backstage at the University of North Carolina, Chapel Hill. If anything, Sounds of Kolachi definitely knows how to put on a show — especially to a non-native Urdu-speaking audience. Loosely categorised as ‘progressive world music,’ most of their performances include sections where musicians and vocalists can improvise and do solos. Music is the main focus and language isn’t a barrier here. Kicking off their performances with a small instrumental — the salami — they gently ease the audience into their music before launching into their originals 'Allah Hi Deyga,' 'Lakh Jatan,' 'Aey Ri Sakhi,' 'Chakardaar,' 'Man Moora,' 'Tarana,' 'Chad Dey' and their version of 'Dam Mast Qalandar.' For the audience at Chapel Hill — which was predominantly composed of college students — they ‘rocked’ it up a few notches. No matter where they perform, though, the two major stars of the shows are usually Gul Mohammad on sarangi and Waqas Husain on sitar. They’ve broken all of the traditional rules regarding the ‘appropriate’ and ‘right’ way to play the instruments handed down to them through generations — Gul’s sarangi is 160-years-old and Waqas is a seventh-generation sitar musician. Encouraged by Ahsan, they launch into solos that sound more like progressive rock than strictly South Asian classical, but using skills of classical music that they have been tutored in from a very young age. In its very essence, it’s a kind of fusion music, experimented by only a rare few from our part of the world. Sitar player Waqas Hussain having a moment during the band's soundcheck at the Savannah Music Festival. And it doesn’t matter what audience they’re playing to: they’re wowed by it every, single time. The same was the case when they performed, a day and a seven-hour drive later, at the Charles H Morris Center in Savannah, Georgia. According to one of the show directors, the venue used to be a fire house located in the middle of what were back then, plantations. With red-brick walls and a high wooden roof, it comes across as somewhat quaint. The 'backstage' area at the Savannah Music Festival was essentially this black tent, which was a lot of fun. "It's just like having a sleepover!" said one of the volunteers at the event. 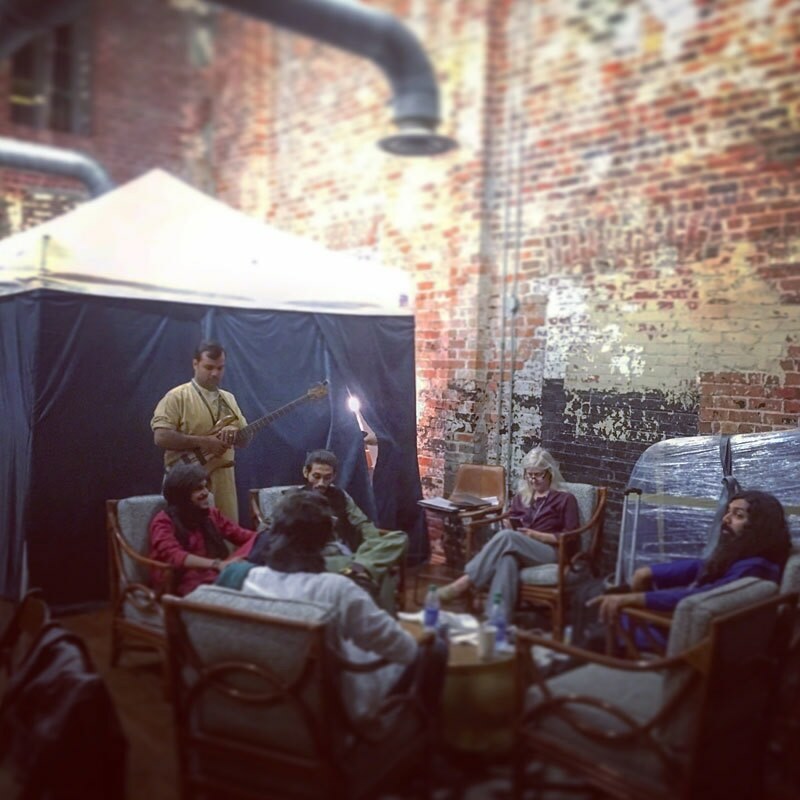 The backstage area for the band wasn’t as fancy as it was back in Chapel Hill, but it had character: it was a black tent in an adjoining hall. “It’s like having a sleepover!” laughed one of the volunteers at the venue. The ‘other’ tent was for the band performing after this: Hiss Golden Messenger, who were in complete contrast to Sounds of Kolachi, their music was more country/western. “It was brilliant!” exclaimed a man to the festival director, Rob Gibson, who was rushing backstage to meet with Ahsan after the performance. They exchanged hugs. “I was in tears!” said Rob. His friend showed up behind him and he hugged her too. He was visibly moved. 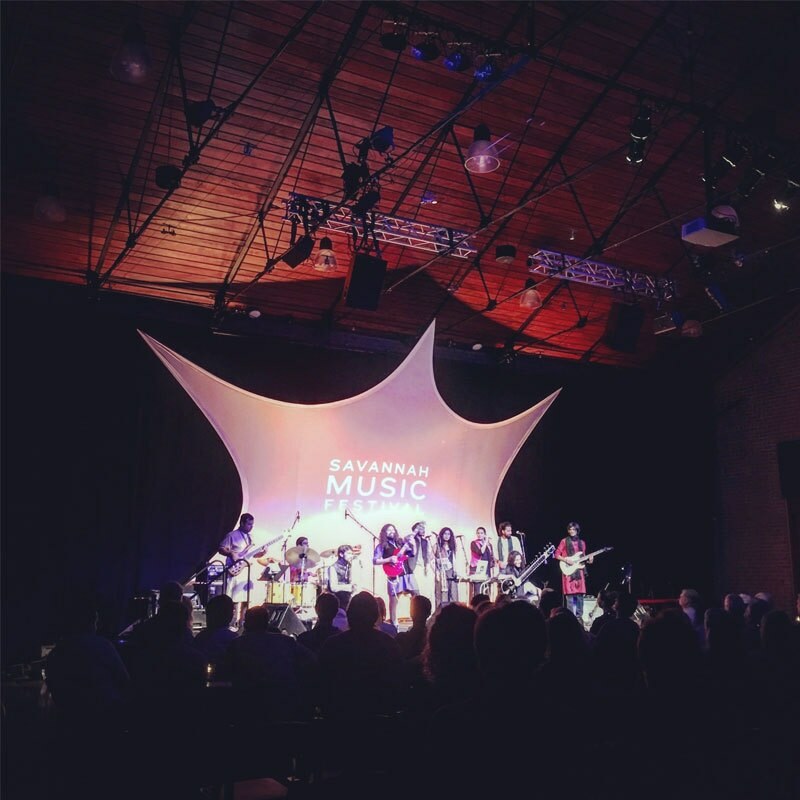 The Savannah Music Festival is spread around Savannah at different venues, which meant that the band and the staff had space to do their jobs properly. Time and again throughout the trip, band members would often comment on the ease with which everything was handled and organised and how professional everyone was. Making or performing music involves a lot of struggling and multi-tasking in our part of the world, so it was not only interesting to see how events were managed but also mull over whether it was possible to introduce similar practices back home. 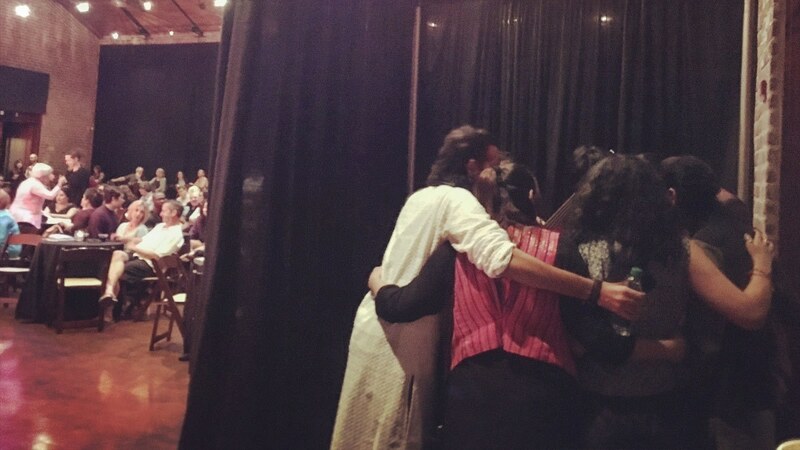 The band huddles together for a massive group hug + prayer before their first performance at the Savannah Music Festival . The audience at the festival was somewhat different from that at Chapel Hill — the atmosphere was a little formal and the audience was more ‘mature’. The band adjusted their performance on day one accordingly: their performance was mellower than usual. It did have a lot of improvisations though and these really hit a chord with the attendees. Sounds of Kolachi got a standing ovation on both, the first and second night (where they threw caution to the wind and amped up their performance) of the festival. Ahsan Bari encouraging Gul Mohammad on the Sarangi during their performance at the Savannah Music Festival. “Yaar, I messed up in this one song,” said one of the backing vocalists. “I sang the wrong lyrics!” It didn’t matter, no one except for them would’ve known anyway. As far as the audience was concerned, they had been thoroughly entertained. "We had a great performance!" 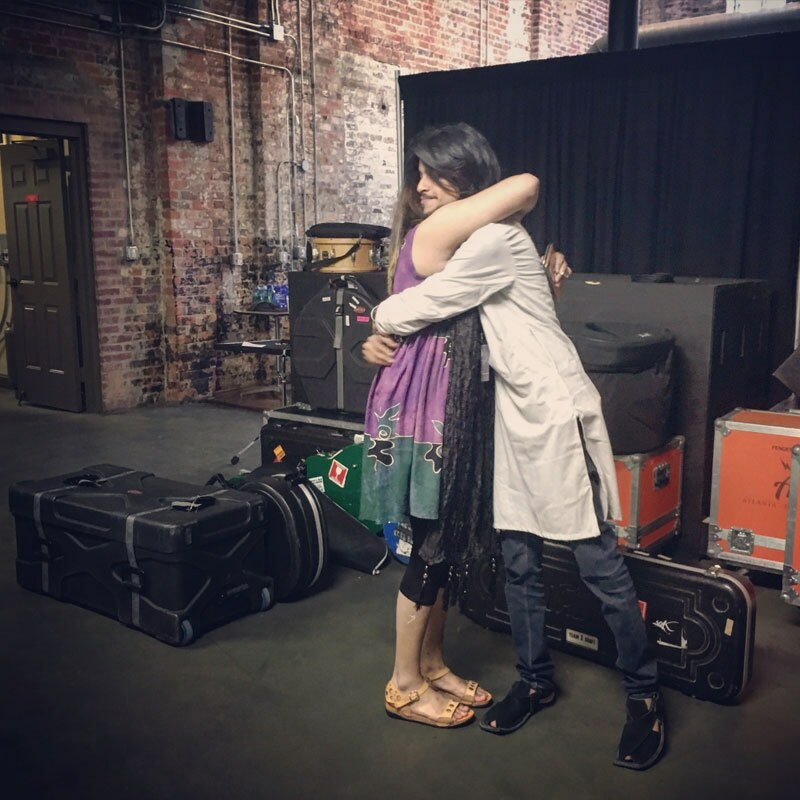 Band members hugging it out right after getting their second standing ovation at the Savannah Music Festival. “Aap ki game on hai,” said Saif to Ahsan at dinner later. “Poori audience gori thi, and they still had a lot of fun. You could have a strong market here.” Ahsan grinned in response. The last few performances had been very encouraging. But it’s still too early to make plans or predictions or know what the future holds. Who knows? Maybe Sounds of Kolachi could very well be the first band from Pakistan to crossover and have an audience that extends beyond just desi communities abroad. But for now, they’re taking one step at a time.